This Saving Time review was made after playing the game 10 times. 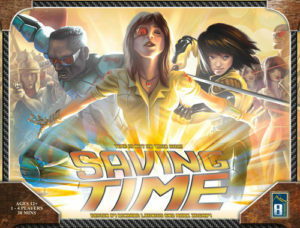 Saving Time is a cooperative time travel game in which you’re trying to stop an alien from wiping out humanity. You’ll move through different ages in history and use your unique skills to try to fix what’s broken, gather information on the alien and, hopefully, catch the alien before it does too much damage. Saving time is published by 8th Summit and designed by Richard Launius and Mark Zoghby. To set up a game of Saving Time, you’ll first lay out the 25 Time Tiles. There are five tiles from each age, which make up the Ancient, Medieval, Early Modern, Modern, and Contemporary eras. You’ll then flip two Crisis cards to determine where the initial crises show up (more on how that works later). 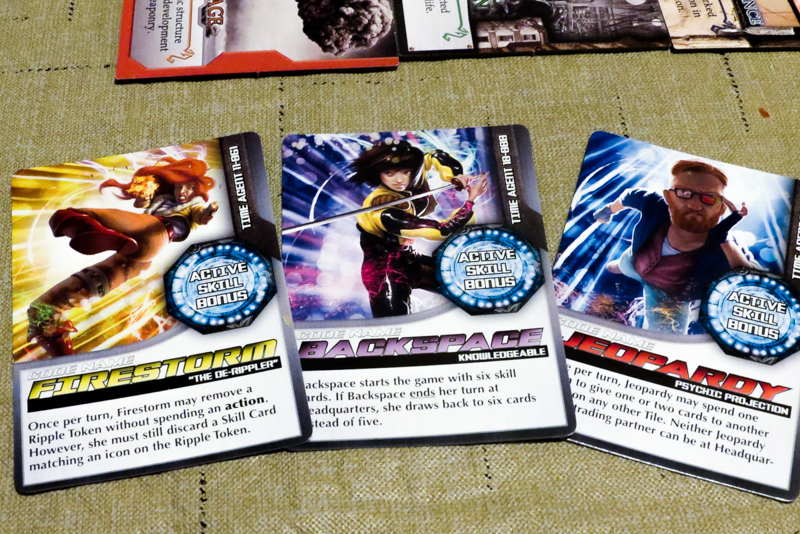 After the tiles are all set up, players will get their starting hands of Skill cards and will choose their Time Agents, each of which has a unique special ability. Then you’ll draw five Alien Capture cards and place them face-down near the play area. Finally, you’ll place the Clue tokens (with two face-up and the rest face-down) and the Ripple tokens near the play area. Each character starts out on the Headquarters tile. Your goal in Saving Time is to find the Clue tokens you’ll need so you can catch the alien, which you’ll do by solving crises in different ages. Each Alien Capture card has an icon that will tell you a specific Clue Token you’ll need, or it will tell you that you need two or three random tokens. Throughout the game you’ll be deciding if you want to flip one of those face-down Alien Capture cards to see what you’ll need, or you will take one of the Clue tokens. You’ll be taking three actions on each of your turns. These actions include moving, time jumping, drawing Skill cards, sharing cards, removing Ripple tokens, and repairing a tile in crisis. To make a normal move (aka Time Run), you’ll simply move to an adjacent tile. When you want to Time Jump from Headquarters to a tile or from one tile to a non-adjacent tile, you’ll need to play a Skill card that has a matching Age icon. 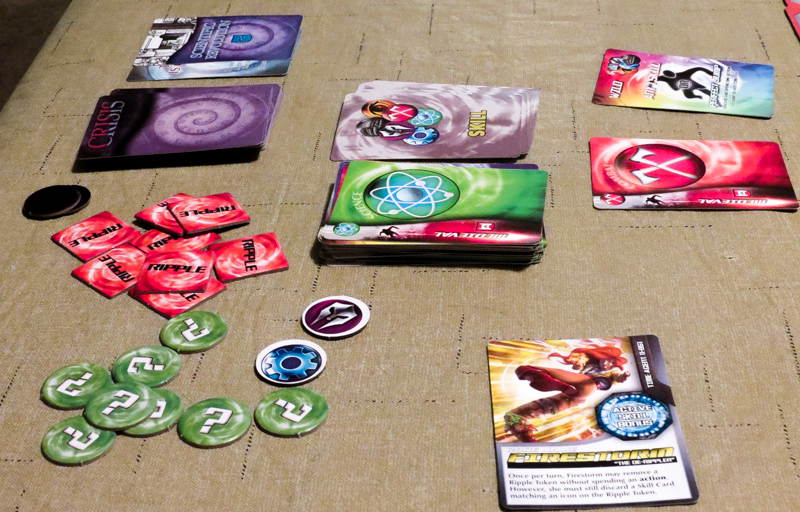 At the end of each player’s turn, the alien causes a bit of chaos. You’ll flip a Crisis card and the matching tile goes into crisis if it wasn’t already in crisis. If a Time Agent is on that tile, nothing happens. When a tile goes into crisis, it is flipped and you will see arrows that tell you where to place Ripple tokens. Tiles in crisis have “tasks,” which are combinations of icons that you’ll need to match with your cards and Active Skill Tokens to repair them. When you repair a tile in crisis, you’ll go straight back to Headquarters where you’ll be able to draw up to a full five-card hand. You’ll also be able to choose between getting a Clue token and flipping an Alien Capture card face-up. Once you have Clue tokens, you can use one of them as an Active Skill Token, which gives you a free Skill icon to use each turn. If you draw a Crisis card and that tile is already in crisis, then you “void” that tile by replacing it with a Void tile. If you ever have to place a fifth Void tile, you lose the game. Not only do you have to pay attention to the tiles, you also have to make sure that the Ripples are kept under control. Each tile has a Ripple Overflow number, which, if met or exceeded, will cause that tile to go into crisis. Any Ripple tokens that are on a tile when it gets flipped (for any reason) are removed from the game permanently. If you ever have to place Ripple tokens and you don’t have enough left in the supply, the tile that matches the current Crisis card gets voided. On your turn you can remove a Ripple token on your tile by playing a matching Skill card or by using your Active Skill Token. These Ripple tokens are placed back into the supply. When everyone decides it’s time to try to capture the alien, you’ll flip over any of the Alien Capture cards that are still face-down and see if you have the Clue tokens that match those cards. If you do, you win! If not, well, you lose! And that’s pretty much how the game works. You’ll take three actions, then a bad card is drawn. The Ripples run out quickly and the Time Tiles void quickly if you aren’t using your cards wisely, so you have to talk about every move you might make to up your chances of winning. The theme is great and probably my group’s favorite thing about Saving Time. We’ve played other time travel board games, but this one is definitely unique. If you’re able to get into the theme while playing, it’s pretty cool feeling like you’re going back in time to stop an alien from messing with the human race. The puzzle itself is a bit of a toughy. Other than when you’re repairing a tile in crisis, you will rarely have obvious decisions to make so you’ll need to think about and talk about the best ways to approach each turn. That’s great and kind of rare in a game like this. Since you do only get three actions on your turn, there is a pretty good flow to Saving Time. Though sometimes you don’t get to do much on your turn (see below), there’s very little downtime and you will be working together on everyone else’s turns. Just about all of the games we’ve played have resulted in close finishes, which tells me that plenty of playtesting went into this one. It’s always nice when tabletop games include player reference cards. The ones that come in Saving Time have all of the actions listed so you’ll very rarely have to reference the rulebook. 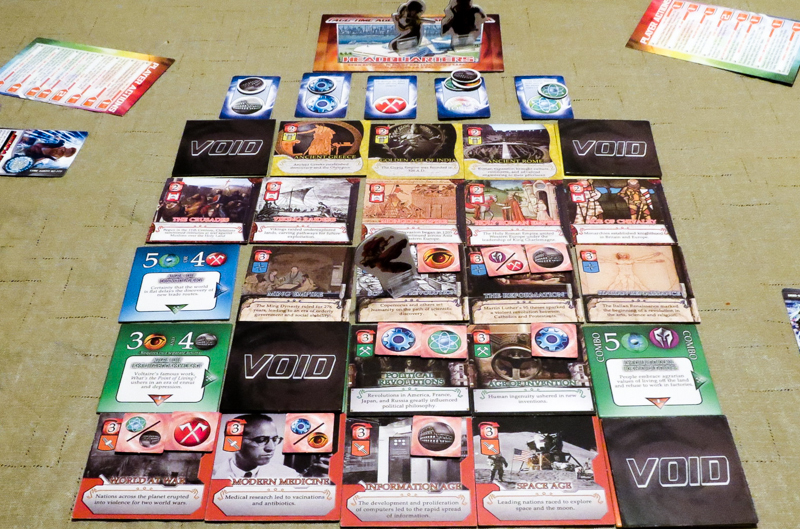 The game plays well at each player count, including solo. There were a few complaints from people in my group about there only being three actions per turn. It’s obvious the designers did this to balance out the game, but it also leads to turns where you don’t really feel like you’re helping the team at all. The cards and tokens look good, but the artwork doesn’t blend well with the artwork on the tiles. I get that they wanted to go with real images (art and photos) on the tiles, but the cards and tiles look like they were made for two different games. 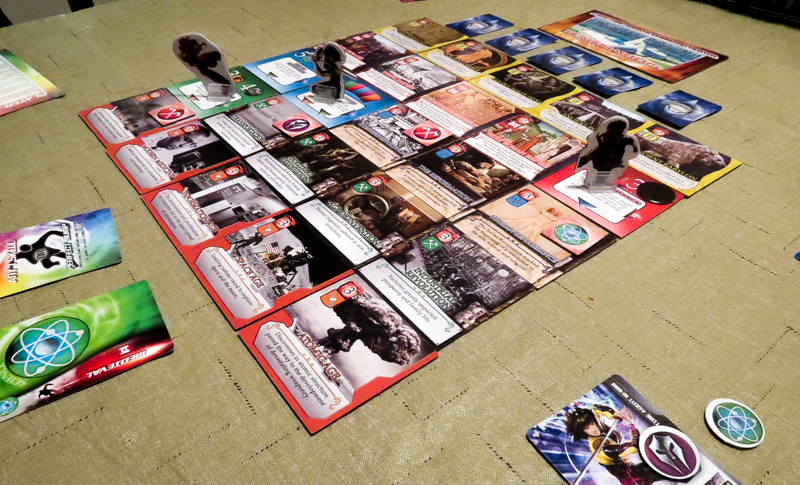 It’s great that you have multiple options to choose from when you repair tiles in crises, but we’ve only turned over more than two Alien Crisis cards in a couple of games. It just seems smarter to take as many Clue tokens as you can so you up your chances of having the right ones when you try to capture the alien. Maybe that’s the wrong approach, but we’ve won the majority of our games by playing this way. There are other family games that my group would play over Saving Time, but some people might find this to be a good addition to their board game collections. Those who like historical components in their games might like all of the eras covered and the historical info found on each tile. This is also one of only a few cooperative time travel games out there. People who enjoy playing games that use the Forbidden Island / Pandemic game system will probably have a good time playing Saving Time. Personally, I like the way Saving Time plays and I like that it’s challenging, but I really wish they had done a bit more with the overall look of the game. That probably would have taken the entire experience to a whole other level… for me, at least. I would definitely play Saving Time if someone else wanted to, but it’s not going to be a go-to family game for me. Thanks for taking the time to read our Saving Time review! And thank you to 8th Summit for providing us with a copy of this game.